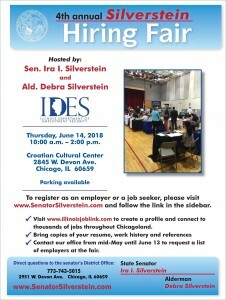 Please join me on Thursday, June 14 for the 4th Annual 50th Ward Hiring Fair, hosted together with State Senator Ira Silverstein and the Illinois Department of Employment Security. Employers will join us at the Croatian Cultural Center, 2845 W. Devon, to seek qualified workers in a wide range of fields. The Hiring Fair will first open to veterans from 10 a.m. to 10:30 a.m. on June 14, then open to the general public from 10:30 a.m. to 2 p.m.
To register for this event, please click here. For more information, call my office at (773) 262-1050.